Happy New Year 2016! Welcome to the Year of Kathryn. What? 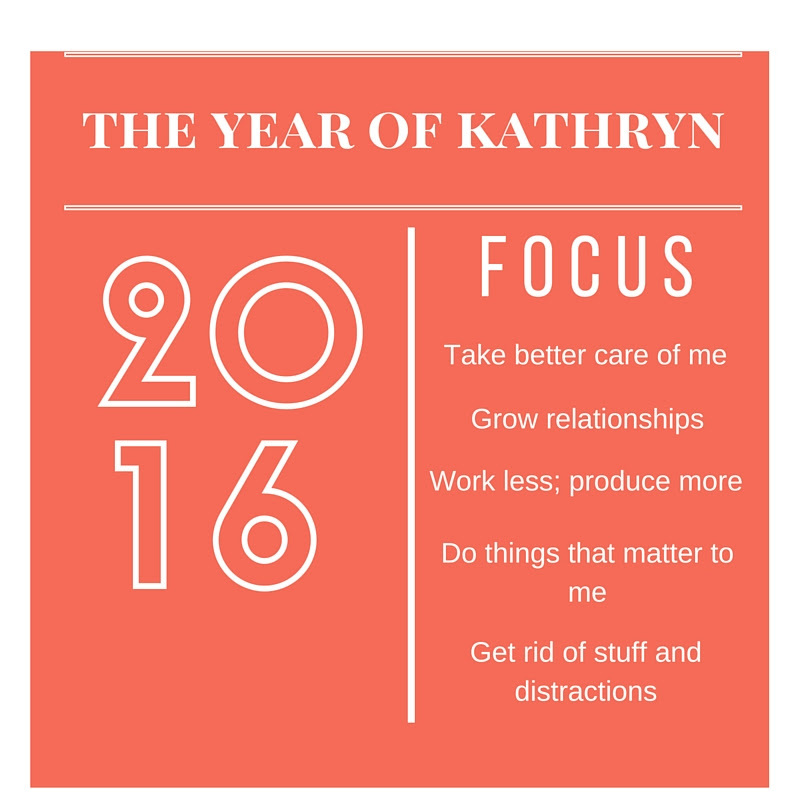 The Year of Kathryn? I realize arrogant, conceited and vain that sounds. Let me explain. Those who know me know I am not an arrogant, conceited and vain person. Over the years, putting the needs of others first has been my focus. However, always putting the needs and wants of others before own has come at a price. 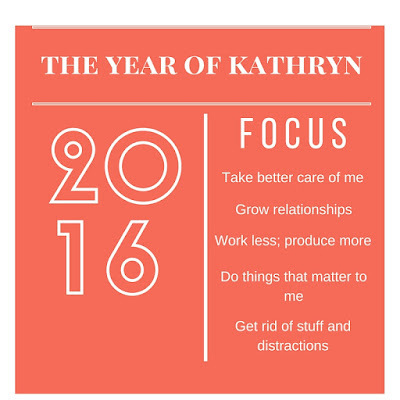 For 2016, the year of Kathryn, my focus will be on these five things. 1. Taking better care of me. Of my 700+ Facebook friends, and the 300+ LinkedIn connections, I actually know a small percentage of those people. It's time to cull the numbers, and grow the relationships. I have too many people I'm 'friends' with that I don't know anything about. If I don't know you in real life or I don't regularly interact with you on other social media, I won't be connecting with you on LinkedIn or on Facebook. Some may think it's social media suicide. I'm willing to take that risk in order to better connect with people I know in the real world, and cultivate the relationships I've developed over the years with people I'm still hoping to meet. I'm changing up my work day. I'll be spending less time in the office. The time I do spend in the office will be more focused. To better understand what I'm talking about read this article. How much of my time in the last year did I spend doing things that mattered to others and not to me? Yeah. Time to change that. I'll be purging stuff in both the real world and the virtual world. I'll be spending less time on distractions. Following through on the above will help to do this. Here's to the Year of Kathryn. Cheers! Copyright by Kathryn Lake Hogan, 2016.